Wish you could ride in the air conditioning during hot Texas summers, or out of the wind in the winter? Need a way to train while either you or your horse recover from injury? Afraid of horses but want to learn to ride them safely? Want to improve communication with your horse and find out exactly what you are telling them with your legs, seat, and hands? A 48″ wide, 5 foot long hydraulic lift (not pictured) allows for easy mounting by those who use wheelchairs, canes, prosthetics, or other aids. 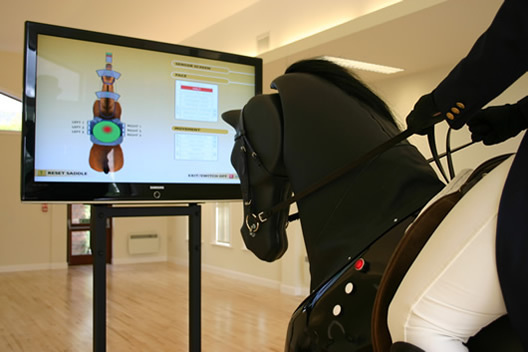 Multiple sensors located in the saddle, head, bit, neck, and sides provide instant feedback about the rider’s balance and posture, weight distribution, use of the hands and reins, and leg pressure and position. Mirrors on both sides allow the rider to see their own position at all times. Xena’s stationary location means that the trainer can literally reach out and touch the rider during all movements and at all gaits, allowing for a level of correction that is not possible when training on a “live” horse. The trainer has complete control of the environment, making Xena the ideal schoolmaster for new students, those overcoming fear or regaining confidence after an incident, para equestrians, or those in fast-paced sports such as barrel racing, vaulting, or eventing. Because she never gets tired and is the same every day, every ride, Xena is the best way to develop muscle memory and increase stamina. Sessions in a simulated arena can be recorded and played back for closer review. For competitive dressage athletes, three levels of dressage tests are available. Feedback is gathered from 5 judges’ views and overhead; your test can be frozen and replayed to analyze parts of your ride in greater detail. Rides can be conducted in a 20 x 40 m or 20 x 60 m arena. Friends and family are welcome to attend your session – the simulator, screens, and mirrors are easily watching through the full-size window in our comfortable viewing room. 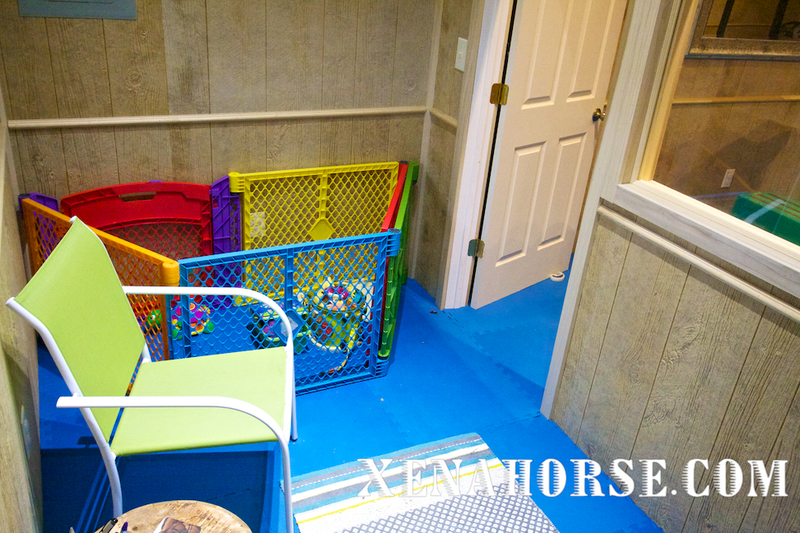 The viewing room includes a secure, child proof play space, complete with toys, for babies under the age of 2. If you are a mother struggling to find time to ride, don’t worry about child care – bring your baby with you! They are welcome, and will be in full view of both you and the instructor during your entire session. All of the team members at All Xena’s are parents, so we understand how hard it can be to juggle parenthood and horses. We’ve come up with some creative solutions ourselves, and will do everything we can to enable you to ride, too. 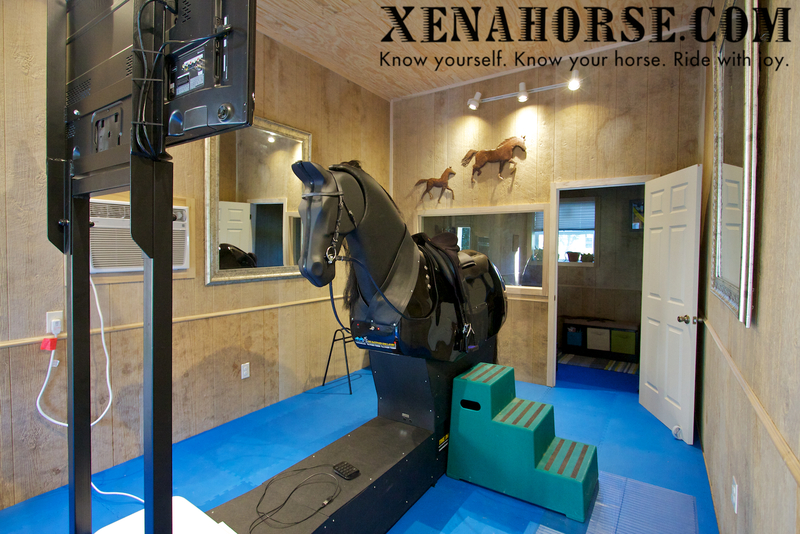 In 2014, pending federal approval (501(c) 3 status pending) the simulator will open to military veterans through The Xena Project, a Texas state-recognized non-profit dedicated to helping veterans into the saddle. Read more about the beginning of an exciting relationship with S.I.R.E., Houston’s Therapeutic Equestrian Centers, in this article published on 30 Sept. Eager to saddle up? 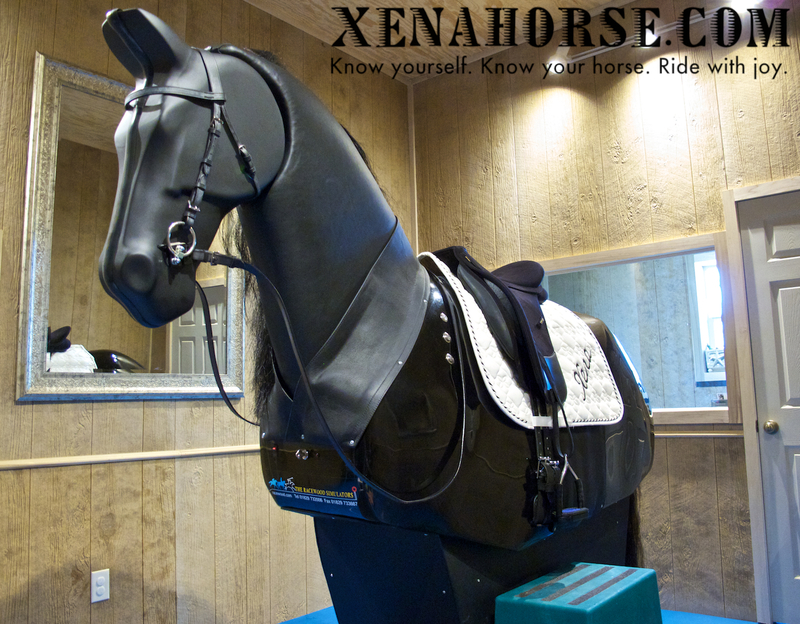 Xena is tacked up and ready for you – schedule an appointment to ride her today!